A gazillion years ago, I spent most of a semester reading the Dear America books. Officially, it was for a grad school paper, but I was also kinda curious. (I’ve now just spent 10 minutes looking for said paper, because I’m totally the kind of person to keep such things. But I can’t find it anywhere. And as it was at least 3 computers ago, I definitely don’t have a digital version.) In the early 2000s, these books had just burst on the scene and were lauded as some magical device to get kids to like history. After all, once you read the one about the Titanic, why wouldn’t you immediately go read about the Carlisle Indian School? At any rate, I was reminded of that long ago paper a few weeks ago, when I finally read the first volume of the Lone Star Journals, Get Along, Little Dogies: The Chisholm Trail Diary of Hallie Lou Wells. Unlike the Dear America series, these are all written by the same author, Lisa Waller Rogers. But they’re definitely in a similar mold–a fictional diary with some additional background information at the end. There are two others in the series–one about the Runaway Scrape after the fall of the Alamo and one about the Galveston Hurricane. And, of course, even more importantly, they’re about my home state of Texas. 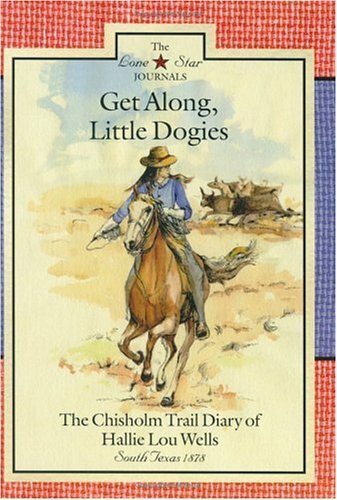 As you might suspect, Get Along, Little Dogies is about a girl who gets to go on a cattle drive. She’s an accomplished horsewoman, kinda annoyed that she’s a girl, and eager for the adventure. Along the way, they run into outlaws, Indians, and all the other things you might expect to happen in such a book. It’s a good, quick read, and the supplemental information includes background on the Chisholm Trail, women on cattle drives (including one of my favorite Texas women, Lizzie Johnson Williams), and lots of photos. My only quibble with this book is that Hallie found serious romance on the trail–and she’s only 14! If I was a kid reading that, I would be horrified. Heck, I’m a little concerned now. I know girls certainly married that young, but I don’t think it happened as often as we assume. These types of books will never be my favorite way of introducing history to kids, since so often they focus on historical objectives rather than a good story. But it is refreshing to see a series for children featuring uniquely Texas stories. I hope Rogers continues writing them–would love to see something on the oil boom at the turn of the century. Now, there’s a rip-roaring tale!